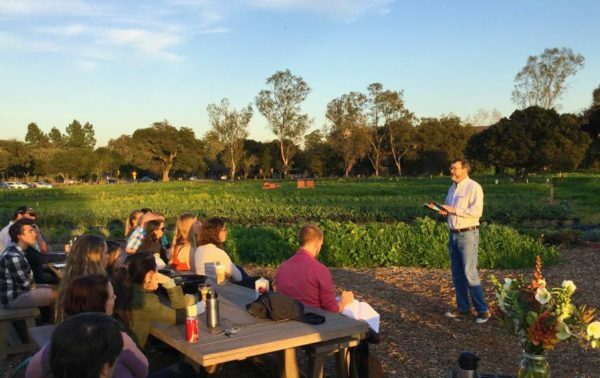 Once every quarter on the Stanford Educational Farm, a group of scientists, writers, farmers, friends, beer-drinkers and everything in between gathers to share stories and ears. Rooted Words is “a reading series for people who like to get their hands dirty.” It’s a casual scene, usually with a healthy mix of students, faculty and community members, all who enjoy giving snaps and learning from one another. Professor Thomas Hayden, Director of the Master of Arts in Earth systems and the primary organizer of the event, likens it to “literary karaoke.” All are welcome to attend, to share any original work or simply to listen. On Wednesday, Oct. 11, the evening was heightened by the smell of ash and burning wood and science fiction-esque skies. At first, it seemed like this edition of Rooted Words was going to be a very intimate affair, as Tom Hayden postulated that the smoke might be keeping some folks indoors. However, true to the fashion of being fashionably late, more students and faculty began to trickle in slowly until the hay bales were all occupied. Friends and classmates greeted each other, popped open a beer or a soda, and new acquaintances were made over the common ground of literature, the farm, pistachios, and cheese puffs. Hayden commenced the evening by thanking everyone for braving the soot, adding with Canadian humbleness: “Gosh, I hate to break up active conversations … it makes me think maybe we should just have beer and chatting.” He expressed gratitude at seeing such a respectable turnout for the first Rooted Words of the year, having initially thought that the evening might turn into just him alone with his cheese puffs – which “would have been fine too” – but the alternative was preferable. With an audience of about 20 or more, seven brave writers stood up to read selections of their poetry and prose. The theme of this session was “encounters.” Each new writer’s voice offered up a landscape, and the group was taken from a coal miner’s home in Appalachia, to a forest in Sumatra, razed by industrial agriculture. They were given eyes into the inner mind of a cherry tree, then a zoo in Santiago, Chile, then a haphazard tourist at the North Rim of the Grand Canyon. Although it’s not an official theme of Rooted Words, many of the readings presented seem to reflect a strong sense of place. Perhaps that’s in part because the people who come to Rooted Words do so not solely to read or to listen, but also to share the space of the farm; to smell the hay, watch the sunset and see chickens roaming freely through rows of flowers. The themes of each individual session, although thought-provoking, function more as diving boards than hard and fast boundaries. Imagine all the possibilities that arise from “encounters.” The first reader of the evening, Steve Hawk, revealed an encounter between himself when he was the executive editor of Sierra Magazine (the storytelling arm of the Sierra Club, our nation’s oldest and largest environmental group), and a former miner in coal country. Straying from the tension one might imagine between a person in the coal industry and a person whose job involved railing against the very same industry, his story was powerfully human. It was a story of loss and loneliness. Emily Dial, a coterm in environmental communication, floored the group with a spoken word piece from the perspective of a fed-up cherry tree. “Y’all gonna play me like that?” the tree demanded, irate after too many one-sided encounters with park strollers who saw it as a “pretty thing,” “delicate” and “ornamental,” when in reality its bark was strong, its petals like fire, its roots deep and dark. To close the evening, Tom Hayden shared his reactions after the death of a celebrity namesake, author and political activist Thomas Hayden. This surprisingly light-hearted piece spoke to all the ways one life can seep into another, despite two people never meeting. In this case, after years of Jane Fonda jokes, mistaken phone calls, and other shenanigans, Hayden described a sort of relief at the passing of OTH (or “Other Tom Hayden”) – like the feeling of finally getting one’s underwear straightened out after walking around all day with an uncomfortable twist. The tradition of Rooted Words will continue in winter quarter, on the third Wednesday. With any luck, the winter session will have clearer skies and fresher air – though it’ll be tough to beat the sunset that dusted the crowd on Oct. 11. Anyone in the Stanford community (and beyond) who enjoys good words, good snacks and good down-to-earth company should make it a point not to miss this event.